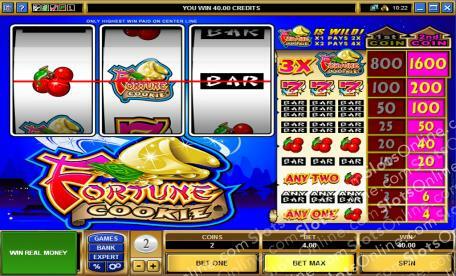 Everyone loves to break open a Fortune Cookie to find out what their future holds, which is why the Fortune Cookie slots are so popular. Click here to play! What better fortune is there than winning a massive jackpot on a traditional 3-reel slots game? It's something you can tell your friends about, or better yet, show them you've won by buying them dinner out at a fancy restaurant. The best thing about the Fortune Cookie slots is that they are simple, just like a Fortune Cookie should be. All you do is play up to 2 coins of your preferred amount on a single payline, and then spin the reels. By matching red cherries, BAR symbols, or lucky 7s, you can win some very generous prize amounts. By playing 2 coins and matching 3 Fortune Cookie symbols on the payline, however, you will win the maximum 1600 coin jackpot! Discover what wealth the future holds for you today by taking a spin of the Fortune Cookie slots. The Fortune Cookie symbol is wild in this game, and it can substitute for any other symbol. Also, when 1 Fortune Cookie symbol is substituting on a winning payline, the prize is doubled. When 2 symbols substitute, the prize is quadrupled.